In 2012, Americans spent $11.8 Billion dollars on bottled water. Many of those buying bottled water do so because they believe their tap water is unhealthy. But the fact is, more often than not the bottled water they purchase is simply filtered tap water! The $11.8 Billion spent, purchased 9.7 billion gallons of water. That’s an average cost of $1.22 per gallon! But is drinking bottled water actually safer than drinking tap water? Surprisingly, the answer is no, and in fact sometimes bottled water can even be bad for your health. that their tap water is dangerous. But the fact is, there are few contaminants in tap water, and those contaminants can be filtered out once you know what they are and use the appropriate filtering system. At $1.22 per gallon, bottled water is about 2,000 times more expensive than tap water. Bottled water companies don’t want you to know that you can filter your tap water yourself for just pennies per gallon. Endangers public health: Bottled water can easily become toxic, and far more dangerous than tap water. If you leave a bottle of water in your car, the heat will cause chemicals like BPA to leach into the water. BPA is a potent endocrine disrupter. In fact, health experts are now saying that pregnant women should never drink bottled water that’s been left in a car. Bottled alkaline water is even worse: Bottled alkaline water is an even bigger scam than regular bottled water, and it’s even more toxic! The problem is that alkaline water leaches antimony (a toxic heavy metal) out of the plastic resin the bottle is made from. Bottled alkaline water is also a lot more expensive than plain bottled water, so people who buy it are actually paying a premium price to poison themselves! Is tap water bad for your health? In some cities, such as Flint, Michigan, the tap water is bad for your health. But in Flint and cities like it, you can use home filtration to make the water safe to drink. When properly filtered with a high quality filter system, tap water is perfectly safe to drink. You’d need a high quality filtration system to filter out contaminants like chlorine and heavy metals like lead. It’s vital to know what contaminants are actually in your water supply. Everyone’s tap water is different. You need to get a copy of your local water quality report to find out what is in your tap water. Your local water quality report is filed annually by your local municipal water utility with the EPA. It lists the contaminants that were found in your local water supply over the past year. Once filtered, tap water is safe to drink, and just as healthy as any bottled water. In fact, some types of bottled water are actually not healthy to drink. Distilled water contains no minerals, and you need to get minerals from the water you’re drinking for good heart health. The World Health Organization recommends that you get 10 – 20% of your daily needs for calcium and magnesium from water. How come? Because your body absorbs minerals from water 30% easier and faster than it does from food or supplements. But while tap water can supply healthy minerals, it doesn’t supply acid-fighting alkalinity or age fighting antioxidant potential. 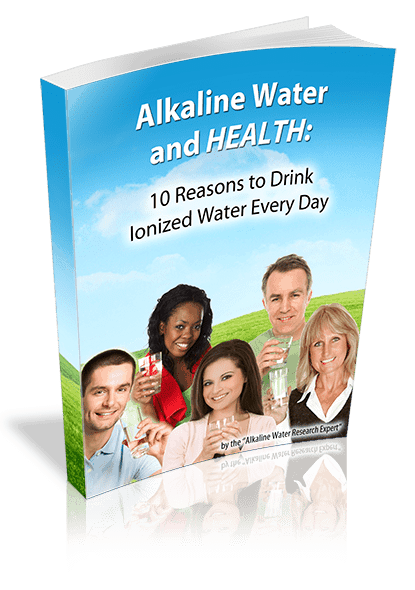 To get those healthy benefits from tap water, you need a water ionizer. As mentioned earlier, you need to filter the contaminants out of your tap water to make it safer to drink. A quality water ionizer such as a Life Ionizer will filter those contaminants out for you. In fact every Life Ionizer comes with free custom-configured filtration that targets the specific contaminants in your water for you. 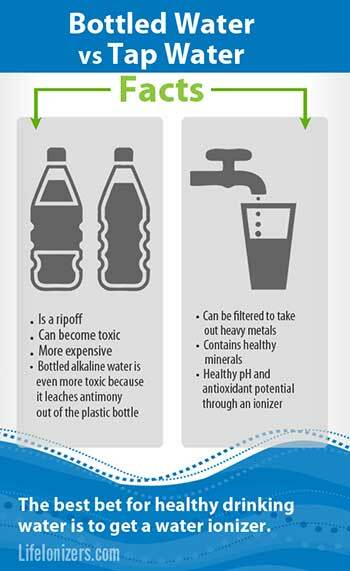 When you buy a Life Ionizer, we do all the work of finding out what toxins are in your tap water for you. We get a copy of your local water quality report, and customize your filtration to target the toxins that are in that report. Once filtered, your Life Ionizer then separates the acidic elements in your water from the alkaline elements. Each is discharged in a separate stream of water. The ionized alkaline water made by a Life Ionizer tastes slightly sweeter, and feels more refreshing than either tap or bottled water – you can taste the difference blindfolded. But even better, your water is then both alkaline and antioxidant. A water ionizer also concentrates the minerals into the alkaline stream coming out of your ionizer so you can get enough minerals in your water to meet the World Health Organization’s 10 – 20% recommendation. There are many health benefits associated with drinking ionized alkaline water, such as improved digestive health, bone health, detoxification and even weight loss. So your best bet for healthy drinking water is to get a water ionizer, or at least simply filter your tap water with an advanced filtering system and drink it. Bottled water is too expensive. It can be unhealthy for you due to contaminants like BPA that leach from the bottle. It is definitely unhealthy for your wallet. Bottled water is a scam, it’s definitely not worth what you pay for it. water. World Health Organization, n.d. Web. 5 Jul 2013. <http://www.who.int/water_sanitation_health/dwq/nutrientsbegin.pdf>.